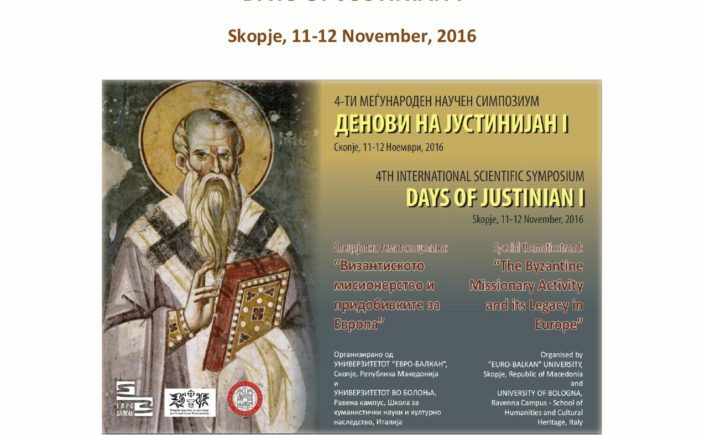 The International scientific symposium “Days of Justinian I” is an annual interdisciplinary scholarly forum aimed at the presentation of the latest research followed by discussions on various aspects of Byzantine and Medieval Studies, that include the treatment and interpretation of cultural, historical and spiritual heritage in contemporary Europe. The Symposium is dedicated to Emperor Justinian I with the aim to address a broad range of issues related to Byzantium and the European Middle Ages, comprising the exploration of the cultural and historical legacy as an integrative component of the diversities and commonalities of Unified Europe. This year the International Symposium “Days of Justinian I” chose a special thematic strand “The Byzantine Missionary Activity and Its Legacy in Europe”, commemorating 1100 years since the death of St. Clement of Ohrid. St. Clement’s missionary activity in Macedonia, grounded on the perseverance of the tradition of Constantine-Cyril and Methodius, demonstrates the complexity of the religious and cultural interactions and the profound impact of the missionary work. Consequently, the missions of Cyril and Methodius received almost no attention in Byzantine sources, while our knowledge of St. Clement’s work is originally based on Byzantine worldview. This notion is relevant both to Medieval and Contemporary times, implying the intricacies in the interpretation of the missionary initiatives and their importance in legitimizing the political and ideological projects. Aside from competing claims, the recurrent appropriation of the traditions arising from the illustrious missionaries from the Middle Ages left a fundamental legacy that transcends the national and cultural borders of Europe. The missionary activity as a universal phenomenon embraces broader issues, geographical areas and chronological scope. Тhe Symposium will address the diverse contours of this phenomenon, exploring various aspects of religion, politics, ideology, identity, ethnicity, literary and artistic expression, political and cultural memory reflected in the historical and cultural legacy. Presentation of the papers will be limited to 10 minutes. Working languages: Macedonian, Italian and English. No participation fee is required. Travel and accommodation expenses are covered by the participants themselves. The full papers will be peer-reviewed by the International Scientific Committee. Papers delivered at the Symposium will be published in the Proceedings of the Symposium. Please check the Euro-Balkan website: www.euba.edu.mk for news on the Symposium, the agenda, special events and the online application form.